For years we have taken pride in doing our summer festival in Kolobrzeg, one of the biggest and most popular tourist destinations along the Baltic Sea coast in Poland. There was a time when we had to fight for permission to hold our programs there, but as the years rolled by, word spread that our event is highly professional, cultural and fun. The city has warmed to us and has even suggested specific dates on which to hold our festival. Unfortunately, last year we were unable to perform in Kolobrzeg because the city was upgrading the waterfront where our event has taken place over the last twenty seven years. This summer we anticipated a big comeback, only to be disappointed when we learned that the renovated area could no longer support the semi-trailer that unfolds into the large stage on which our show takes place. Nandini dasi, as determined as ever, met with the mayor of Kolobrzeg to discuss alternative sites for our event. “As much as we’d like to host you, there is no suitable site where we can hold an outdoor event the size of yours,” the mayor told Nandini. The mayor shook his head. The large paved area around the lighthouse was crawling with thousands of tourists when Nandini arrived. “This would be perfect for our event,” she thought. But when she was asking the secretary if she could speak to the captain, he walked out of his office and stopped her speaking before she could even start. “But how did you know that was what I was going to ask?” Nandini said. Nandini scurried out of the office as fast as she could and reached for her phone. “Gurudeva, we got permission for the festival in Kolobrzeg,” she said when I answered the phone. She was obviously on the verge of tears. The next day 100 devotees charged out of our base into two large buses to begin advertising the festival. “Faster!” I told our bus driver. “Your event is still two days away. Why the hurry?” he asked. Further down the beach I saw a woman crying. Out of the corner of my eye, I saw a man speaking angrily to a devotee. The man interrupted in a loud voice. “Why didn’t you come last year?” People began to gather around, interested in the apparent conflict. “Excuse me?” I asked, still not understanding the nature of his dissatisfaction. A number of people in the crowd nodded their heads in agreement. “Well, the captain of the port to be specific,” I said. We stopped to have kirtan in one place, and, as always, a large crowd of sunbathers gathered. Many of them were soon dancing with us. “Would you like to hear my opinion about this singing and dancing?” a nicely dressed gentleman asked me. As the blissful singing and dancing continued, I watched one lady who had joined the kirtan as soon as we had arrived. She was beaming as she swayed back and forth with her arms around two devotee girls, chanting in a loud voice. Then she entered the circle of devotees and began dancing on her own, her arms stretched towards the sky. She stayed for more than an hour. “Looks like you really enjoyed that!” I said to her as the kirtan party moved on down the beach. Further down the beach a man came towards me. The next moment a woman approached me, a Bhagavad-gita in her hand. “Yes, of course I will,” I said. “Oh, but the Bible is also an important scripture,” I said. We concluded the harinam after four hours and returned to the festival site to prepare for the crowds that would come. On the boardwalk, a man called out to me. My guilt subsided a little knowing that the meeting occurred nineteen years ago. “It was just a short talk…” I said. The festival site was already crowded with people sitting on the benches in front of the main stage. “The show doesn’t begin for another two hours,” I said incredulously to Guru Kripa das. “I guess because there was no festival last year they want to make sure they don’t miss anything this year,” he said. The festival looked especially charming with the lighthouse towering overhead and the beautiful port as a backdrop. More and more people poured through the gates, and I took the opportunity to ask them why they had come. It started to rain midway through the program, but the people were prepared: everyone in the audience popped open an umbrella as if on cue. When it was time for my lecture, I prayed to Srila Prabhupada. When I came off the stage forty five minutes later, there was, as always, a small group of people with Bhagavad-gitas to be signed. “I am genetics scientist,” said the first woman. I saw she was not holding a book, and I flinched expecting a debate about science and religion. I wished I had the scientific jargon to make my presentation more acceptable to her. “From my spiritual master,” I said proudly. “Was he a scientist?” she asked. “I was thinking the same thing,” I said with a smile. Next in line was a man holding the Gita so tightly that initially I couldn’t take it from his hand to sign. “It will just take one minute to sign,” I said. The next person in line was a man with a big handlebar moustache. He stood silently as I signed his Bhagavad-gita. “What inspired you to buy the book?” I said hoping to initiate a conversation. “It gives me reason to inquire about birth and death,” he said without smiling. Next a man in a wheelchair came up to me. “Where did you get all the knowledge that you wrote in these purports?” he asked. The last man in line was dressed nicely and had been waiting a considerable amount of time. When I apologized for this, he smiled. When I handed his book back to him I asked him what his profession was. I was curious because he looked so aristocratic. As he walked away clutching the book tightly under his arm I thought of my spiritual master, and I prayed to him. I settled into the science classroom in the school that would once again be our base for our summer festival tour. The walls were crowded with test tubes, microscopes and colored bottles filled with liquid. Guru Kripa das laughed out loud as he looked around the room. The next morning we held a meeting with the 250 devotees who had joined us for the summer tour. There were many new faces; a number of the veterans from previous tours had not returned this year, either because they had to work, were recently married or had other responsibilities. Scanning the crowd, I suddenly realized I was the only devotee present who had been on the first Polish tour twenty six years ago. I welcomed the devotees and gave a talk requesting them to give everything to Lord Caitanya’s sankirtan movement for the next three months. The tour, I explained, is a unique kind of festival within Srila Prabhupada’s movement. Temple festivals provide devotees with the opportunity to enjoy kirtan, katha and prasadam, but our festival program is specifically for non-devotees. Our job is to work in the background in order to give them the chance to experience the kirtan, classes and prasadam that we enjoy. It means a lot of self-sacrifice on the part of the team, but the reward is seeing others happily experiencing Krsna consciousness for the first time. The devotees didn’t have to wait long to see such changes of heart. The next day, within minutes of our harinam party entering the crowded beach to advertise our first festival, a gentleman began enthusiastically taking photos of us. That he was taking photos wasn’t unusual in and of itself; what was unusual was that he didn’t stop. He continued following us for forty five minutes, shooting frame after frame of the brightly dressed matajis, the mrdanga players and the synchronized devotee dancers. Finally I walked over to him. “Sir, why so many photos?” I asked. A few minutes further down the beach, a lady jumped up from her towel and came over to me. That evening the crowds flooded into our festival grounds. I watched, spellbound; even after twenty six years, the sight still amazed me. As I watched some festival goers settled down to enjoy the continuous stage show, while others milled around the restaurant, the shops, the book stalls, the yoga classes, the face painting, and the many other attractions. As I was walking, I noticed a woman in her twenties with a sad look on her face standing at the perimeter of the festival. She was holding a big basket of flowers. “How much do they cost?” I asked. There was a long pause. She regarded me with wide-eyed amazement. Her eyes filled with tears as I pulled out 100 zlotys, took all the flowers, and handed them to Mathuranath. One of the lady devotees took the flower girl towards the stalls. Guru Kripa turned to me. I continued my walk around the festival site. On the stage, our new theatrical performance “Vrindavan” was in full swing, the audience mesmerized by the performance of the thirty two actors. Meanwhile, all sixteen tents that bordered the festival area were full of people soaking up the various aspects of Vedic culture on display. In the book tent, people were browsing through Srila Prabhupada’s books and asking the devotees behind the counter questions. I saw an elderly woman concluding her purchase of Bhagavad-Gita at the cash register. “It’s a wonderful book,” I said to her. It was time for me to head to the stage to give my lecture. “How many times have I given this talk?” I asked Guru Kripa. “More like at least 1008 times, if not double that,” I said. With Gita in hand I walked onto the stage and went straight to the front, my translator Mondakini dasi by my side. As a young boy I was always shy about speaking in public, but I’ve never experienced fear when delivering a lecture on Krsna consciousness. The reason is simple: the philosophy is perfect and complete. For a person who studies it and lives it, the philosophy is attractive because it provides a logical explanation of spiritual life and a positive alternative for solving all problems by returning to the spiritual world. At the end of the lecture, I descended the stairs to find a small group of people with Bhagavad-Gitas in their hands, waiting for me to sign them. The first to approach me was a sixteen-year-old girl who said that it was the eighth summer festival she had attended. Next two girls approached me with a Bhagavad-Gita. I signed ten Bhagavad Gitas, and as I was finishing two boys ran up to me. “And you came to hear my lecture?” I asked. Walking to the restaurant beside the boys, I marveled at how Srila Prabhupada’s movement appeals to people of all ages. “Even to very young philosophers,” I thought. Outside the book tent I saw the flower girl emerging with a big smile on her face and one of Srila Prabhupada’s books under her arm. “So there’s the result!” I said aloud. “Welcome home!” Mahavan dasa, a Russian disciple, greeted me as I came out of New Delhi’s slick new airport terminal, tired after my flight from Bangalore. Mahavan is my secretary when I travel in India. A brahmachari in his thirties, he wears saffron, shaves his head, and stuffs his bag with the latest gadgets—cell phones, iPads, ear buds, chargers. No one was giving the man anything. As we watched, a teenage boy shoved him aside. The monk covered his face with his hands and sat down on a bench. A moment later, an affluent-looking couple walked past, and he got up and approached them, but they too ignored him, and when he persisted the man shouted at him. The monk looked flustered. He sat back down on the bench and stared straight ahead, as if in contemplation. Despite his bedraggled condition, he appeared effulgent. “For someone like you I have all the time in the world,” I said. We walked toward the bench he had been sitting on. He continued to hold onto my sleeve. “How in the world did he manage to find such peace right after being mistreated?” I wondered. The minutes passed, and I felt a wave of tranquility come over me as well. Finally he opened his eyes. He didn’t look directly at me, but stared into the distance as he told me his story. “And what service do you do in the monastery?” I asked. I wondered how many hundreds or even thousands of disciples such a man could have. I took his hand. “I will help you,” I said. “You can see me through my eyes?” I asked. “Yes” he replied. “I have learned this from our Tibetan masters.” He looked straight into my eyes with a steady stare. Feeling uncomfortable, I looked away, but he caught my chin with his hand and turned my head toward him so he could study my face. His small hand had a powerful grip. I also looked at his face. His dark brown eyes peered out from slanted eyelids that curved upward at the outer corners, reminding me of Tibetan art. He had a small flattish nose, and his thin lips, though fixed in a determined line, seemed to be slightly, almost imperceptibly, smiling. He obviously had not shaved for some days, and his golden skin bore a few small scars. He seemed to glow with a radiance that I could feel more than see, and the softly pungent fragrance of Tibetan incense still hovered about his stained, travel-weary clothes. Though his head barely came up to my nose, I had the feeling that I was standing in front of someone large and powerful, someone who could knock me over with the flick of a finger. “Oh really?” I said. I could hear the disappointment in my own voice. People stopped to stare at the unusual sight: a sannyasi sitting on a bench and a Buddhist monk meditating on the ground next to him. They looked at me as if asking for an explanation, but I had none. I could only sit silently while he offered prayers on my behalf. “Well, gosh,” I said. “Thanks so much.” I got up and helped him back onto the bench. I felt the hair on my arms stand up. “No!” I said running after him. “I won’t let you be mistreated by those people again. Please take this donation. It’s enough to get you to Bodh Gaya and back to Tibet by train.” I pushed some bills into his hand. “We won’t meet again in this lifetime,” he said. “But I will leave you a special gift in the monastery in Lhasa. When you arrive, mention my name. The monks will direct you.” He took a small piece of paper from the sleeve of his robe and wrote down the address of the monastery. I felt goose bumps erupt on my body. “Do you mean money?” I asked. Time passes quickly when you are doing something you love, and since the devotees love spreading Krsna consciousness, the summer flew by. Our schedule was intense—a festival every day—but the reward of seeing people smile and dance with us was enough to keep us going. And we got this reward every day. “All the time,” I said. “We sure are,” I said, handing her an invitation. “Will there be samosas?” she asked. I called out to the kirtan party and waved for them to come back. “You lead the way,” I said to her. We chanted behind her as she led us to her part of town, and we stayed for an hour, chanting and dancing. She waved to us from the doorway of her store as we left. “See you tonight!” she shouted with a huge smile. Our detour had made us late for prasada. The devotees ate a hurried meal and began preparing for the festival. Half an hour or so before the festival was to begin, I saw a man, a woman and their young daughter sitting in the front row of benches. I walked up to them. “It will be a little while before things get going,” I said. Hungry from the day’s activities, I decided to go to our restaurant. Inside the tent, a young teenage girl carrying a plate of prasada came up to me. “I’ve always wanted to thank you for how you changed my life,” she said. “Five years ago I came with my parents to your festival. I put on a sari in the fashion tent, and when I came out you were standing there. You said I looked like an angel. I was just a child then, but I was touched by your words, and I decided I should actually become like an angel. I started going to church more, and every night I prayed to God. “Uh… Did you say ‘slaves’?” I asked. “So there aren’t any slaves?” he said. “Nope,” I said. “No slaves.” He shook his head and wandered off into the theater tent to wait with the others for the show to start. “I’ve been attending your festivals each summer for fifteen years,” he said as I began writing. “But this time something just clicked, and I decided it was high time that I bought a book and went deeper into your philosophy. I smiled. “Better late than never,” I said and handed the book back to him. Then I saw a man dressed in a suit, wearing old-fashioned glasses and carrying a small briefcase. He looked like an old professor, and I could see that he wanted to talk to me. I excused myself from the young woman I had been talking to, and stood up to receive him. “May I have a brief word with you?” he asked. “Very good,” he said. He turned to leave, but I called after him. “You know very well what that means,” he said with a smile. When I was giving my talk from the stage that evening, I saw him on the last bench furiously writing. At the end of the lecture, I made my way over to where he had been sitting, but he had gone. I was hoping we could all share this inspiration with the festivalgoers, but ironically, it was they who became the source of inspiration while we became the receivers. “Well thank you ma’am,” I thought. “Now wasn’t that just what we needed to hear to get us started again!” We turned back and continued down the beach. After chanting on the beach, we made our way into town to the main street, crowded with tourists and locals. I was following behind the kirtan party when I felt a man behind me put his arm around my neck in a choke hold. All I could see were the tattoos on his sweaty arm. “So you’re the festival guru, is it?” he said in broken English. “Festival guru?” I said, squirming to get free. “Protecting me?” I said, feeling a bit nervous. “Got my back?” I asked. “Yep,” he said. “And I earned it.” He finally let me out of the headlock. “See them guys over there?” he said. I looked over at two men. One had a swollen eye and the other had blood running from his nose. It didn’t help me relax. “Uh, yeah,” I said with a hard gulp. “Well, uh, that’s very nice of you,” I said. “I’m the UFC champion for Europe,” he said, smiling. “You mean you’re a cage fighter?” I asked. Now I was curious. “Is there some reason you are giving me this honor?” I asked. I was beginning to breathe easy. “So you’ll come tonight?” I said. “You seem to know our food very well,” I said to her, as her friends began buying. Tears came to her eyes and began rolling down her face. She seemed unable to say anything more. She took up the prasadam she had bought and walked out of the tent. As we were about to leave, a young woman in her early twenties walked into the restaurant carrying a large bundle of red roses. She was dressed in brightly colored traditional Polish clothes, even a head scarf. She looked poor, and I noticed her open money purse was empty. When no one showed even the slightest interest, she stood silently gazing at the prasadam behind the glass counter. “She must be hungry,” I thought. Her eyes opened wide and her eyebrows went up. Her head tilted slightly. “Really?” she said. She gave me a rose and began choosing her meal. She walked outside with a big smile on her face and sat down at one of the restaurant tables. The stage show had just begun, and I saw that she became absorbed in watching it as she ate. After an hour I sent her a fruit drink from the restaurant. I wanted to see how the festival site looked from a distance, so I went outside the gate, where I noticed a live-butterfly exhibition next door. The woman selling tickets called me over. Colorful and beautiful as the butterflies were, I was eager to return to the festival. As I entered the grounds, a middle-aged woman came up to me. “I met you ten years ago to the day,” she said. “It was at a festival just like this, but somewhat smaller. When I showed an interest in the philosophy, you spent an hour speaking to me and convinced me to start chanting Hare Krsna on beads. You encouraged me by saying it was enough to chant one or two times around the beads each day. But I soon became attracted to the chanting and for the last 10 years I have been chanting 25 times around the beads each day. You also explained to me the importance of following the four rules. Since that day I have followed them strictly. “You gave me a Bhagavad-gita. I have read it many times and memorized over 100 verses. I share the wisdom I have learned with whomever I meet, and as a result, a number of people in my town are also chanting and reading Bhagavad-gita. Some of us meet regularly and chant together. Except for those people, I don’t associate much with others. My dream is to go to Vrindavan before I die. It was time for me to give my talk on the main stage. As I talked about the basics of Krsna consciousness, I saw many people listening attentively. A number of them nodded their heads in approval whenever I made a significant point. Then I thought about last Kartika, when I prayed with all my heart to Sri Sri Radha Govinda, the presiding deities in Jaipur, begging Them to empower my words so that I could convince others about Krsna consciousness. When I saw the audience’s response, I remembered Sri Sri Radha Govinda again and felt Their presence. After my talk, there was a line of people waiting for me to sign the books they had bought. The first man in the line handed me his Bhagavad-gita. “Are you a scientist?” I asked. “That will never happen,” he said, but he gave me a smile as he walked off holding the book tightly under his arm. Another woman handed me a photo album along with her Bhagavad-gita. The album contained photos of our festivals from every summer of the past 15 years. Next to each photo was the invitation we distributed that particular summer. “We keep track of our happiness,” the lady said with a smile. As the festival closed that evening, I felt a sense of deep satisfaction, knowing that thousands of people from all walks of life—young children, elderly couples, UFC champions, flower girls, and atheists—had had the chance to experience the wonderful world of Krsna consciousness. I began to wonder if I hadn’t even received more inspiration than I had given. Once again, I stand before you on the annual occasion of your auspicious Vyasa Puja, the celebration of your appearance in this world. I take this opportunity each year to reflect on the great mercy you have bestowed upon me in the form of service to your mission. I am very happy to be a small part of your great legacy in fulfilling Lord Caitanya’s prophecy that His holy names would be heard in every town and village on this planet. I can report that beyond a doubt this is happening here in Poland, due in part to the festival program we have been maintaining for over 20 years. The preaching you started nearly 50 years ago continues to grow and expand despite the rapid advancement of Kali Yuga portrayed in ominous headlines and photos of the world’s daily newspapers. This alone is proof of the blessings you received from your own guru maharaja, Srila Bhaktisiddhanta Saraswati Thakur. Once, when some of your sannyasi godbrothers complained to your spiritual master that he was giving you – a householder at the time – too much attention, he shot back, “Don’t complain. In the end he will do everything!” And indeed it has come to pass. No one can contest your achievements in establishing Krsna consciousness around the world: your books, the farms you began, the gurukula system you introduced, the scientific approach you established for preaching Krsna consciousness—the list goes on and on. But no less amazing in my eyes was your ability to deliver me. Before meeting you I fully embraced all the dreadful activities that characterize this horrible age. Once my father chastised me saying, “Son, you’re a misfit! There’s no place for you in society. I shudder to think what will become of you!” Srila Prabhupada, what he said was true; there was no place for me in material life. But by taking shelter of your lotus feet I was elevated to the topmost transcendental position of being your humble servant, a destination for which even the demigods surely aspire. Each year, the meaning of this verse becomes clearer to me, for whenever I work hard to spread Krsna consciousness a strong desire to visit Vrindavan awakens within my heart. Conversely, after spending time in the dhama an equally strong desire appears in my heart to spread the glories of the holy names far and wide. I am confident that one day I will become qualified to understand and serve the innermost desires of your heart. I must only remain loyal to you and continue to endeavor to share my good fortune with others. Srila Prabhupada, I am very happy in my service to you. I harbor no doubts, misgivings or illusions about my position as your servant. I would do anything for you. If you ordered me to go to hell and preach, I’d jump on the first train spiraling down to that lake of fire, happily chanting the holy names all the while. If you instructed me to preach in heaven, I’d arrive in that celestial abode with no other interest than to serve your order. This is because I’ve already seen heaven and hell in my many years of service to you in this world, and I’ve concluded there is no shelter other than your lotus feet. Some time ago I had a dream in which you were sitting with a number of my senior godbrothers including Tamal Krsna Goswami, Giriraj Swami, Radhanath Swami, Vaisesika Prabhu and others. I was observing the scene from some distance away. At one point you smiled and said to them, “So all of you are going back to Godhead.” I was dumbstruck by your mercy, while at the same time wishing I could be as fortunate as them. Of course it was only a dream. However, you once said that although dreams are illusions, “dreams of the spiritual master are very nice.” Srila Prabhupada, I’ve never known your words to be untrue. It is one of the reasons that I have full faith in you and that my desire to assist your mission in this world becomes stronger day by day. You once wrote to me that you felt your spiritual master was always “watching over and protecting you.” Please also watch over and protect me as I assist you with your service in this world. Then at a suitable time, when you see fit, please grant me eternal service to you in the transcendental abode. 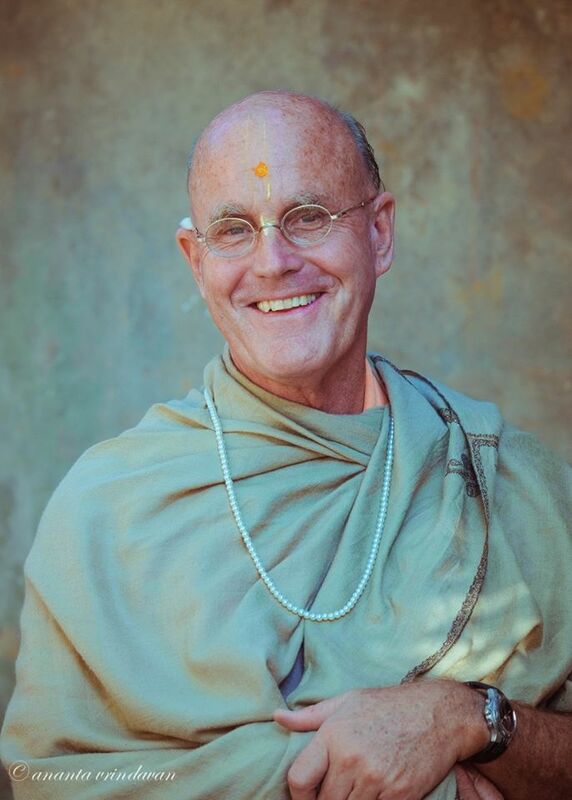 It was a week after the Sadhu Sanga Retreat in North Carolina last May, and I was in Los Angeles waiting to board a flight to London and then on to Warsaw, when an older gentleman walked up to me. He looked at my sannyasa robes. “You must be a Hare Krishna,” he said with a strong Polish accent. “Hare Krsna is a famous religion in my county,” he said, interrupting me with a smile. “Oh really?” I said feigning ignorance. “That helps a little,” I said. “I could do this for the rest of my life,” I replied. And indeed I have. I am indebted to my spiritual master, Srila Prabhupada, who encouraged his disciples to share Krsna consciousness with the whole world through the chanting of the holy names. I could never give it up. Within moments we had crossed through the town and descended on the beach, which had quickly filled up with people as soon as the sun came out. As we were taking off our shoes to walk barefoot in the sand a young man in his late twenties approached me. I braced myself for some harsh words. As we started chanting and dancing down the beach giving out invitations, I noticed a mother grabbing her young daughter and pulling her to her side. “Don’t be afraid, darling,” the mother said. “They won’t kidnap you. They’re just collecting money for the poor people in India.” Her words brought a smile to my face. “And the people will think ill of us,” I replied. “Stop the kirtan!” I yelled. Most of the devotees had not seen the woman and were surprised that I ordered the blissful kirtan to stop. We walked in total silence for a good twenty meters. “OK!” I shouted. “Kirtan!” The devotees began chanting enthusiastically. The devotee who had objected to stopping the kirtan also heard the man. I winked at him. After all the invitations had been passed out, I took the kirtan through town on the way to the festival site. As we stopped at a red light, a taxi drove by. The driver put his head out the window and shouted out the name of one of Srila Prabhupada’s books. That evening thousands of people passed through our festival site. Again I found myself on stage sharing the truths of the Bhagavad Gita. When I saw that people were not catching a point, I would illustrate it with an anecdote. When they caught the point and their faces lit up, I felt as if I’d achieved a great victory. “No,” I said. “I’m his servant.” I put a Bhagavad Gita in her hand. “Here is one of the books he wrote,” I continued. “You will get great satisfaction from reading it.” She bought the book. “Nothing happens by chance,” I said, “especially in spiritual life.” I picked up a Bhagavad Gita from a table nearby and handed to him. He smiled as he gave a generous donation. “Is this your first Hare Krsna festival?” I asked as I started to sign the book. “What part of the festival did you enjoy the most?” I continued.